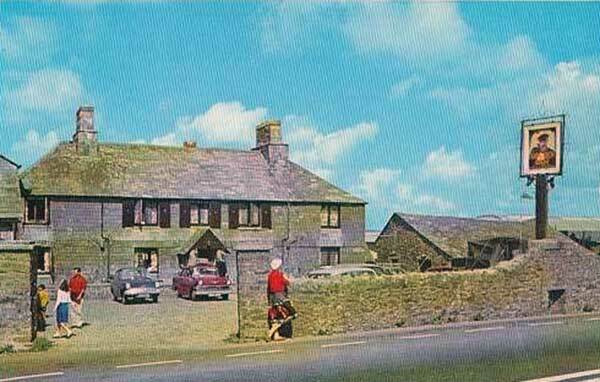 Jamaica Inn | Launceston Then! Although there is at least one map showing Roman roads that cross Bodmin Moor following a path similar to the present A30’s route, up to the mid 18th century, there were very little decent routes across the moor barring an old packhorse track dating from Norman times. Most of the traffic squirted around the bleak moorland taking the route to Bodmin from Launceston via Egloskerry, Tresmeer, and Camelford. A 1684 survey by A. K. Hamilton Jenkins found “The roads of Cornwall remaining for the most part in their primitive state, still following the Highland Ridges, as in ancient times and descend to the valleys by break neck hills, where some river had to be crossed.” It was for this reason that the Summer Assizes were held at Launceston, with Judges, Attorney’s and their retinue being very reticent on travelling any further into Cornwall. The route via Camelford was improved for Coach travel in the early 19th century, but it wasn’t until 1754 when a Bodmin innkeeper, at his own expense, at every quarter of a mile had direction and distance stones erected along the old packhorse route. At the same time the beginning’s of the route being improved started, but in consequence were not completed until around 1780. 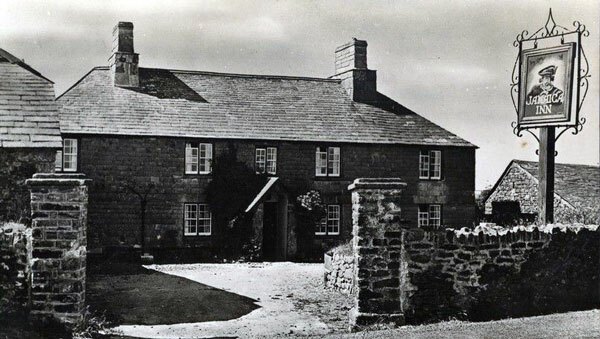 With the improvements, there was a need for accommodation along this new route and so roughly mid way between Launceston and Bodmin on land owned by the Trelawney family, a new inn was built in 1750 called simply ‘The New Inn’ (shown as such in the Tithe Apportionment). The building was initially detached, with four downstairs rooms and five above. a large cow shed was constructed to the left as you looked at the inn, and to its right were a row of outhouses and barns. In total, the inn held 80 acres of farmland as well. In 1769 with the new ‘Toll Road’ nearing completion, toll houses were installed along the route at Pennygillam, Treguddick, Holloway, Two Bridges, Plusha, Palmers Bridge (below) and at Callywith near Bodmin. 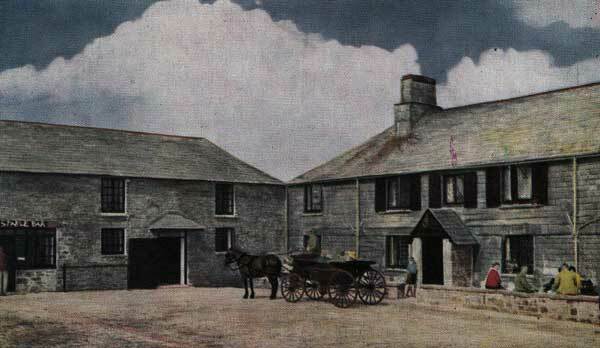 With the new turnpike finished the traffic use soon increased and in 1778 the inn underwent its first renovation. 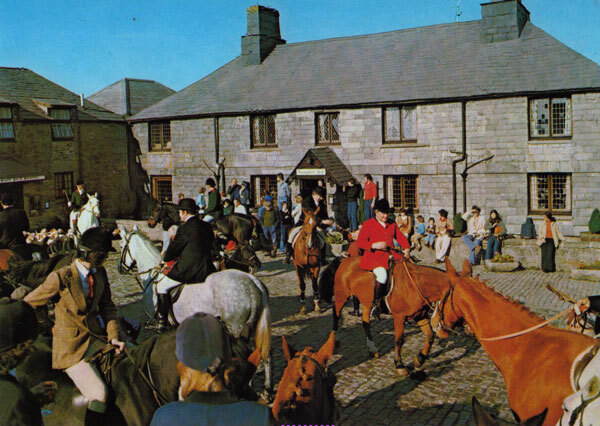 A new stable block was constructed built onto the front of the cow shed extending to adjoin the inn, forming the L-shaped building that is still present today. In an effort to weatherproof the building was slate hung. 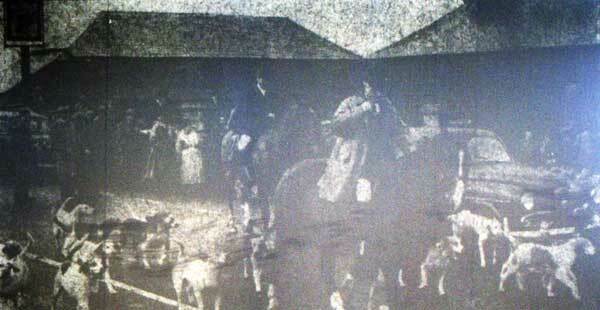 It was also at this time that the two cottages and a row of three farmworkers cottages were built opposite. 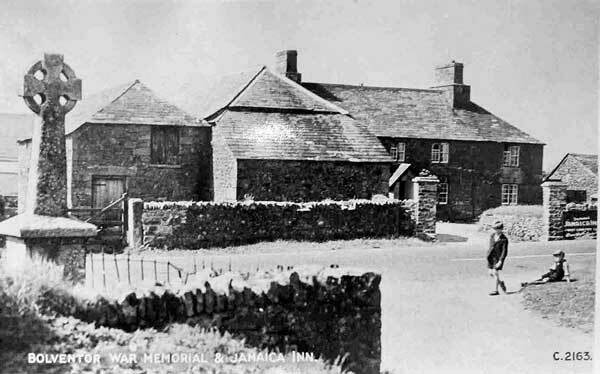 It was around this date that the name was changed to ‘Jamaica Inn’ when a member of the Trelawney family, the then Lords of the Manor, through various family members were Governors in Jamaica. It was possibly in the honour of Sir William Trelawney who died in Jamaica whilst still governor in 1772. The first known ownership of the inn comes from a 99-year lease drawn up in 1784 between Admiral William Langdon and John Broad, innkeeper. This agreement also included the Dryworks Plantation which was east of the inn in St. Lukes Valley. The Lower Park on Symons Ham and Shepherds Hill, Altarnun and the area around inn were also included. From a “Lease and Release” document from October 1785, the property again changed hands for £350, “(1) Elias Lang of Tredethy, St. Mabyn, esq., to (2) Sir Jn. Morshead of Trenant Park. All that part of manor of St. Neot consisting of Redmoor in St. Neot, late in occ. of Mary Bennett, and Tolborough or Trewint Moor and Wett Hill in St. Neot, Altarnun, Blisland and St. Breward late in occ. of Geo. Devonshire, now of Jn. 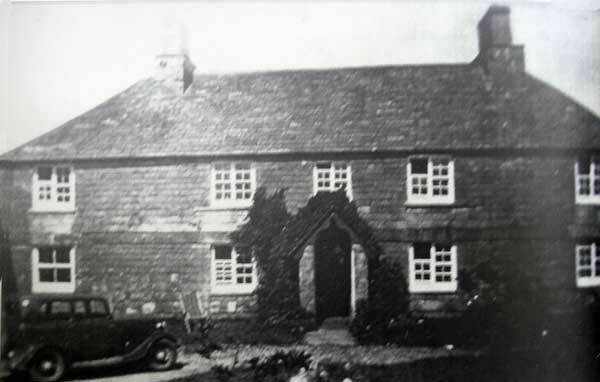 Broad, innkeeper.” In fact by now John Broad had taken over the tenancy of ‘The London Inn’ (now ‘The Kings Head’) at Five Lanes, with his brother, James Broad, taking over the Jamaica Inn tenancy. This agreement continued after James’s death in 1803 with his widow Elizabeth, taking over the tenancy of which she continued until 1828. In a letter written on September 11th, 1818 from Gordon Booker at Catchfrench to Sarah Booker at Dawlish, gives a description of what the hospitality was like at that time: Thanking her for her letter. Orders to write every day to say how they all are – will come immediately if needed. Mr. Betenson forgot to post Gordon’s letter. Describes shooting on the moor near Trebartha, near “Bold Venture alias the Jamaica Inn where good entertainment is falsely promised to man and horse inside I never beheld. We resolved to give our horses some corn and to indulge in some bread and cheese or a chop, being of dinner very hungry – it unfortunately happened, said our hostess, for the first (time) these 14 years that the Guard had forgot to bring her bread – she was entirely out of cheese just at that time and, in fire, a mug of decent beer was all that could be procured. There was a piece of ? Carion looking mutton but we could not eat it without bread and the pototo crop had failed – the oats were still in the field, unluckily for the horses …” Does not intend to go to the moor again. Home next week. In 1846 most of the estate was sold on with ninety-nine year leases with the Tithe Map of 1841 showing that the ‘Bold Adventure’ landowner was then one Edward Archer of Trelaske, Lewannick. 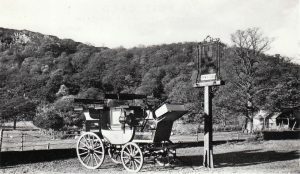 At this time the tenants of the inn were John Langstone and Thomas Dunn and in 1843 Thomas ran an advert stating that the inn was being refitted to encourage more Coach trade. Stage Coaches (above), Post Chaises and the Mail Coaches came up from Penzance, stopping in Falmouth for the mail coming off the Packet Ships and made their way up through Cornwall stopping at inn stages of around seven miles. With the method of changing horses at Coaching Inns, the journey time from Falmouth to London had been reduced to forty-one hours by 1805. 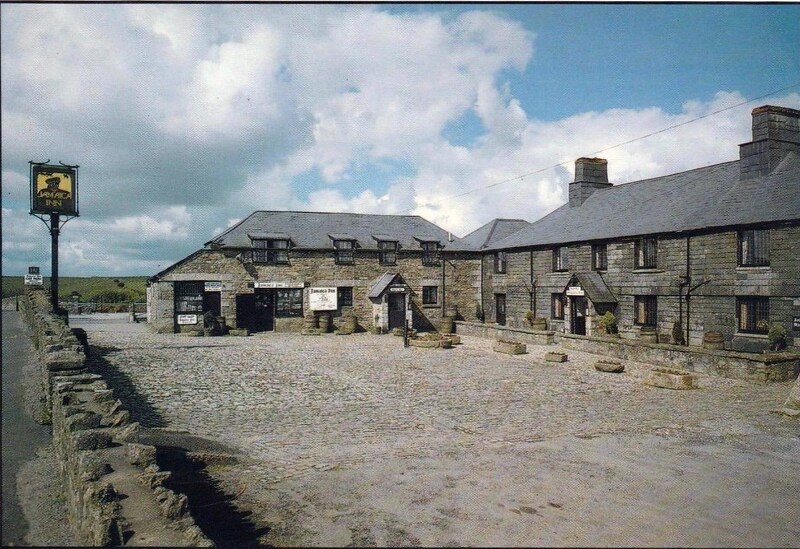 Jamaica Inn was a Posting House with ‘The White Hart’s’ of Bodmin and Launceston and ‘The Kings Head’ being Coaching Inns. Fast daytime services would demand fourpence to sixpence a mile for those passengers traveling inside the coach, and twopence or threepence for those on top. William Medland took over the tenancy from Thomas Dunn and was followed by the entrepreneurial John Colwill in 1858. It was he who advertised the Inn as, “accommodating Hunting Parties, and having well-aired beds and good stabling.” During his tenancy, further reconstruction took place at the Inn, which then offered seventeen rooms, of which eight were bedrooms. John Colwill was followed in 1872 by William Mason who in turn was followed in quick succession by Sergeant Courtney Doidge and then Mr. and Mrs. Hawkes. When Mr. Hawkes died in November 1879 his wife, Mary, took over the lease. 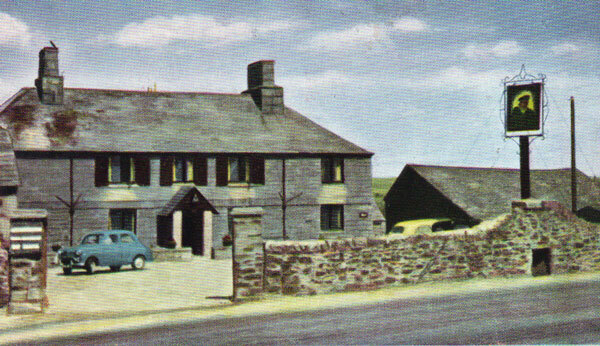 At this time Methodism had gained in strength across the whole of Cornwall, and even such places with notoriety as Jamaica Inn were not immune, and in 1880 it became alcohol-free and was known as ‘The Jamaica Inn Temperance Hotel.’ It was to remain a temperance hotel until the Second World War. During Mary’s tenancy, she was assisted by joint Landlords Francis Bray and W. P. Chegwin. 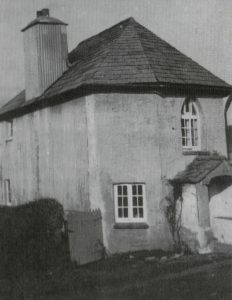 The water supply was by means of a waterwheel situated below the grounds of the old Vicarage, which pumped the water into two large 500 gallon tanks in the loft of the Inn, and some of it was then drawn off into two large slate tanks hidden under a large dry stone walled grassy mounds by the entrance and road wall. Here on the roadside of the wall was fixed a tap for the villagers to draw their water supply. Going into the 20th century little changed at the Inn. Bert Horrell took over as Tenant Landlord in 1923 and its during his tenancy that the Inn, by chance, took on its notorious fame. 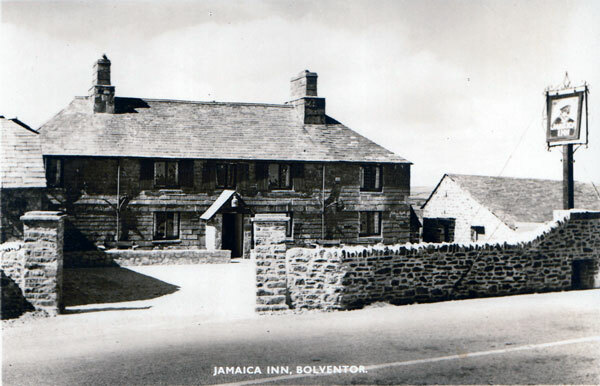 The authoress, Daphne du Maurier and her friend Foy Quiller Couch were staying at Jamaica Inn during November 1930. In the afternoon they set off across the desolate and sinister moor and lost their way. Darkness fell, it was raining and the two young women had little hope of finding their way back. They found a derelict barn and Daphne was keen to stay there but Foy thought they would catch their death if they did so, putting their trust in the horses, they allowed themselves to be led across the moor until they eventually saw the lights of Jamaica Inn in the distance and knew that the instinct of the horses had saved them and much to the relief of Bert Horrell, who had lanterns ready to commence a search. The following year, the two friends came back for a second stay, this time paying a visit to Altarnun and its church of St. Nonna. 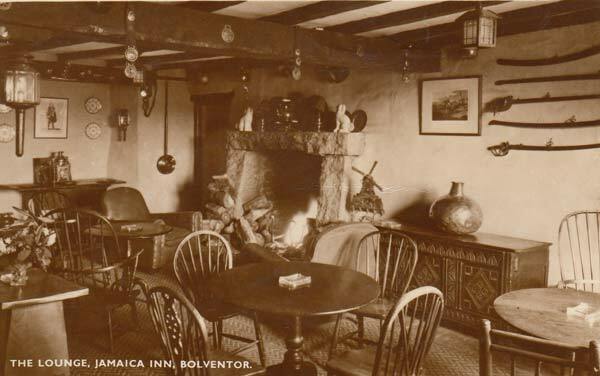 These two visits left an enormous impression on Daphne, and in 1936 she had her novel, ‘Jamaica Inn’ published and so the die was cast for the actual Inn’s future. 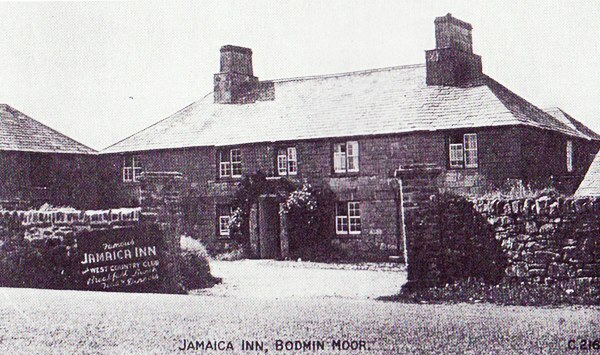 Writing shortly after the book was published Daphne remarked, “Jamaica Inn stands today, hospitable and kindly, a temperance house on the twenty-mile road between Bodmin and Launceston. In the following story of adventure I have pictured it as it might have been over a hundred and twenty years ago; and although existing place-names figure in the pages, the characters and events described are entirely imaginary“. 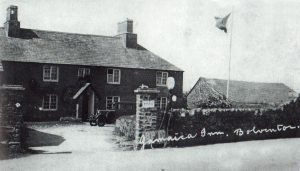 Jamaica Inn was the first of three du Maurier novels to be filmed by Alfred Hitchcock. The others were Rebecca and The Birds. The film was co-produced by Charles Laughton, who insisted that the unknown Irish actress Maureen O’Hara play the female lead. He later played opposite her again in The Hunchback of Notre Dame. 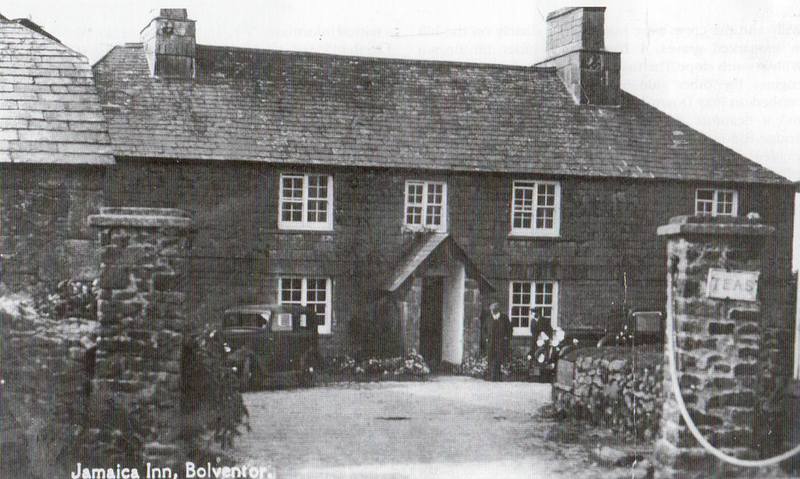 The Rodd family finally sold the 2,300 acres of land in and around Bolventor in 1938 to local Auctioneer and Estate Agent, Walter Dennis, which subsequently led to the gradual selling off of the individual properties including the Inn. 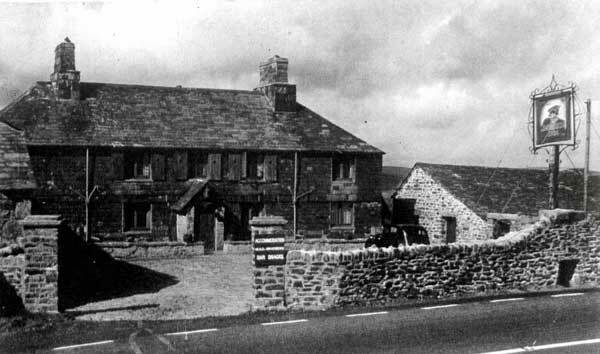 Jamaica Inn with the water tank mound just inside the entrance in the 1930’s. 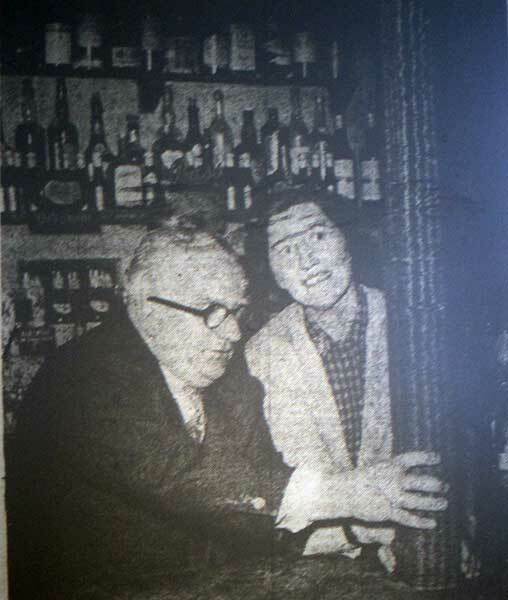 In 1939 Bert Horrell left his tenancy, being succeeded as landlord by Claude Finnemore. Claude was an accomplished organist and gave lessons whilst at the Inn. 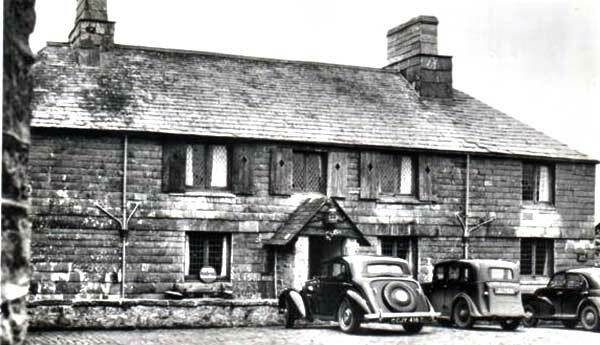 Claude himself stayed for the duration of the Second World War leaving in 1945 when Walter Dennis sold the Inn to Stanley Thomas of Plymouth for £5,000. He immediately set about applying for a license to turn the Inn into a club, which was duly granted. And so ‘The Famous Jamaica Inn West Country Club’ was born. Membership for one year cost one shilling. Three applications were made for a full license between 1946 and 1949, and facing strong local opposition, each were rejected. 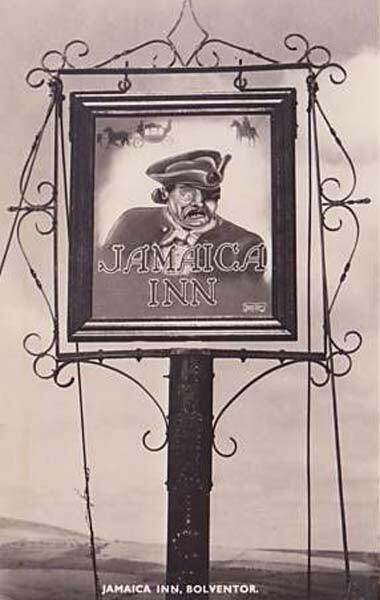 However, a fourth application in 1950 proved successful and after 70 years, Jamaica Inn was able to sell alcohol. 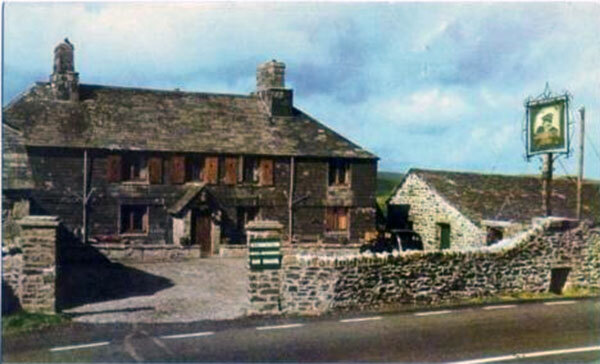 The other problem facing Stanley Thomas when he took over, was the dilapidated state of the Inn. Ridden with woodworm, the floors were covered with old lino in all of the rooms, and rats infested both the Inn and the land surrounding it. He set about repairing the sorry looking Inn with gusto. 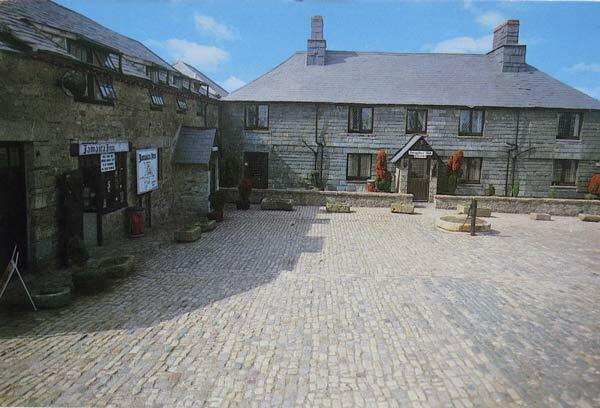 He removed the slate water tanks and mound, and with cobbles brought up from Plymouth bus routes – when the old trolley lines were taken up – to finish off a new cobbled courtyard. This became the first car park. Stanley also had the old sash windows removed and installed the shuttered pseudo-Victorian windows. 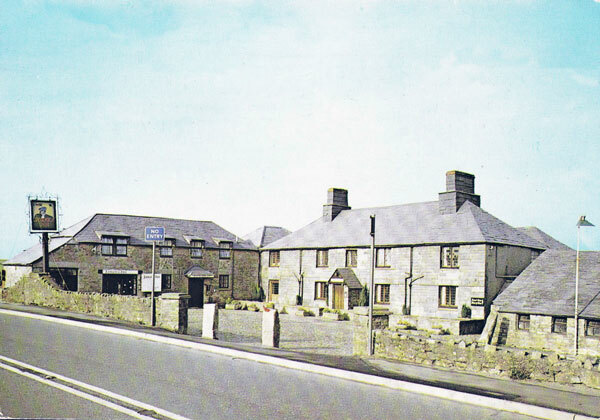 In 1954 he purchased the Jamaica Cottages (below) and the 23 acres of land between the A30 and the St. Cleer road, together with the cottage that was the former Smithy. 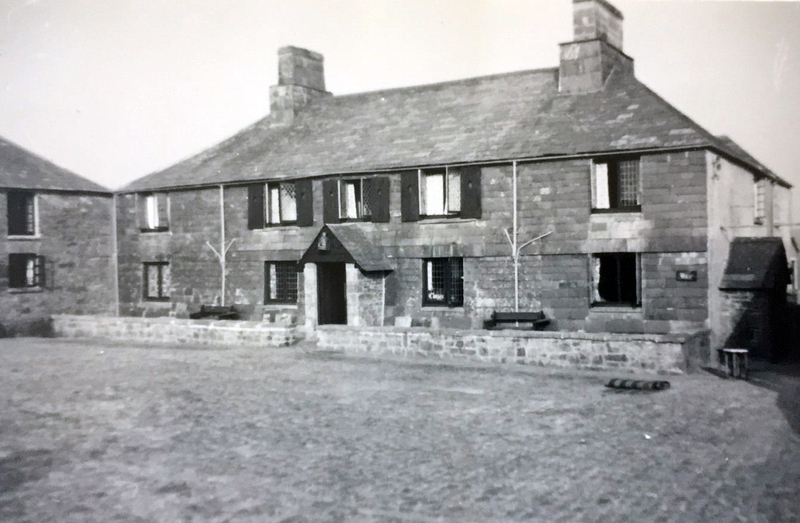 The Jamaica Cottages were purchased with the aim to use them as an overflow for guests from the in, but now being famous no one was interested and so became what was known as the Staff Annexe. Bolventor Village and Jamaica Cottages c.1920. Stanley Thomas (below) did not live on the premises and employed a quick succession of managers until Mr. and Mrs. Grose came to work for him. Another of his managers employed in 1960 was Peter Mositano. He had the habit without warning of approaching his customers and cut off the ends of their ties! This then formed a collection of tie ends pinned above the outer door of the children’s room. It was also during Mositano’s helm that the opening of the Stable bar occurred and he turned the back kitchen into the Pedlar’s bar. 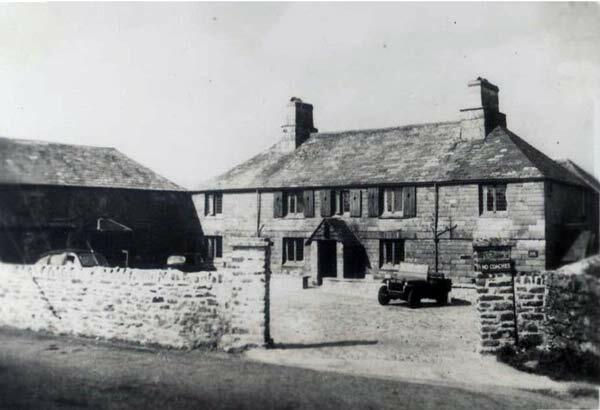 Stanley sold the 23 acres of land in 1961 to Mary Wonnacott, who herself, moved into the Jamaica Inn Farmhouse, and he finally sold Jamaica Inn to William and Margaret Palmer in the November 1962. Jamaica Inn owner Mr. Stanley Thomas pushing over a stack of pennies collected for the St. Teresa Home charity in 1958. 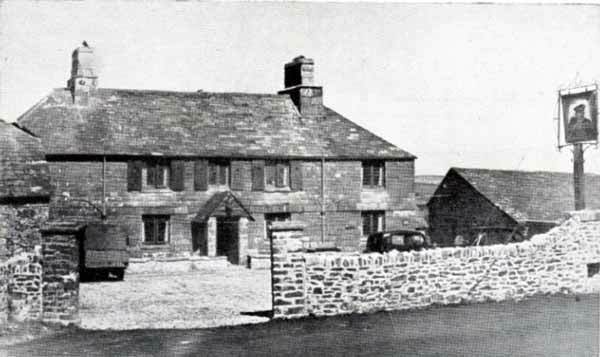 Stanley Thomas left behind a really altered appearance of the Inn which had fundamentally changed the character of the old Inn. The Palmer’s continued with the alterations with a connection from the Inn to the outside toilets (former calf shed), by putting a roof across to make a covered way for storing beer barrels and it was a very controversial move which greatly upset the local villagers, who had used that pathway for their access to the moor. The dispute lasted for years and latter owners were eventually involved in litigation over the rights of way and although they were subsequently fined, the right of way remained blocked. 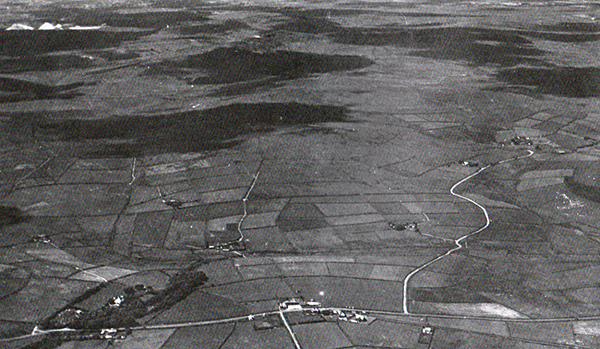 This dispute became irrelevant when the village was by-passed in 1993, cutting the whole village off from the moor. The Palmers built the garage which became the Inn gift shop and they also moved the shop from the stable block back into the inn. The dinning room to the left of the front door becoming the shop. 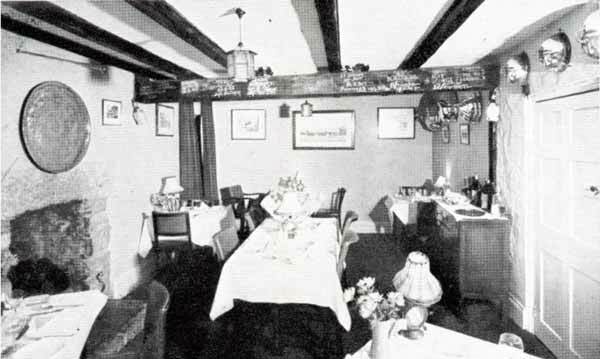 Peter Mositano did not get along with the Palmer’s and by the time they themselves had sold the Inn in 1964, he had left. The purchaser this time was its most famous, and ironically given how the Inn obtained its celebrity, a novelist. The bestseller Alistair Maclean paid £27,500 when he purchased the Inn on July 24th of that year. He is remembered as being a ‘real gentleman’ although rather modest to his own work. He spent very little time at the Inn, and only actually stayed once and that was for three days in May 1972. He left his brother, Captain Maclean, to oversee the much of the running of the Inn, but a succession of Managers were hired for the day to day business. 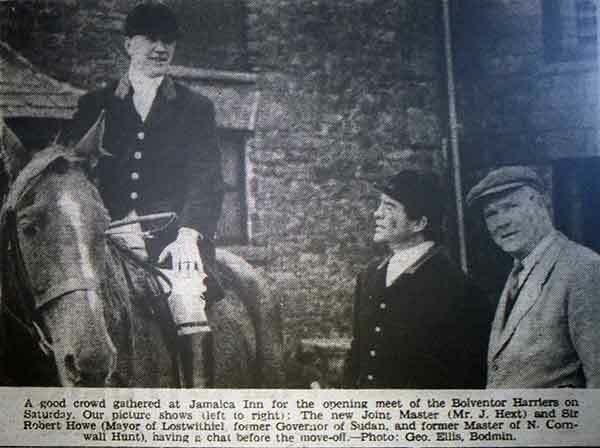 It was during Maclean’s ownership that the Inn was developed as a Hotel, using a grant of £2,759 to convert more of the stable block and creating a Manager’s flat above it. 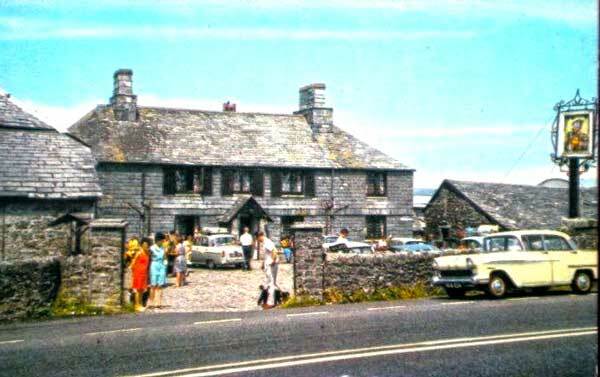 The Inn, however, failed to provide the return on his investment that he had expected and so in 1973 he placed the Inn on the market. It was purchased on December 3rd, 1973 by John and Wendy Watts for the sum of £46,000. Under their ownership, the Inn was completely transformed with many alterations inside and out. One of their additions was the ‘Potter’s Museum of Curiosity’ in 1980. This was founded by Victorian Taxidermist, Walter Potter, in 1861 in Bramber, West Sussex. Walter had begun his Taxidermy hobby in his teens and after he had started to show off his work to enthusiastic audiences his father built a house for him and his family and the museum was born. The Watts were looking to add further attractions back at Bolventor and saw this as a way to do this, and a building was erected adjoining the outside toilets to house the new collection. In 1998 the ‘Smugglers Museum’ was added, offering a new experience for visitors. 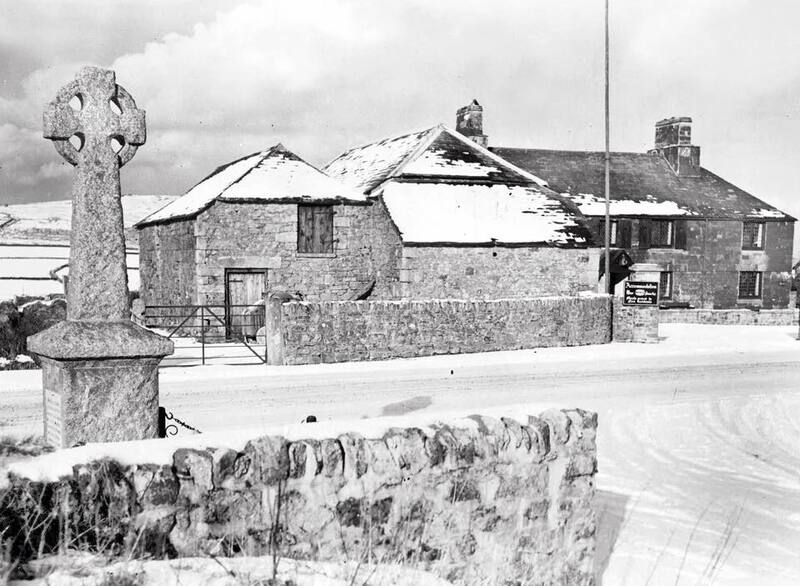 This was originally situated in the old School, on the St. Cleer Road, but when the Potter’s Museum was closed down in 2003, the Smugglers Museum was moved into its place. The decision to close the Potter’s Museum had been taken as the Watts had retired and could no longer give it the time. The collection was sold off at auction for £500,000 with celebrities including comedian Harry Hill, photographer David Bailey and artist Peter Blake snapped up pieces from the 10,000-item collection. 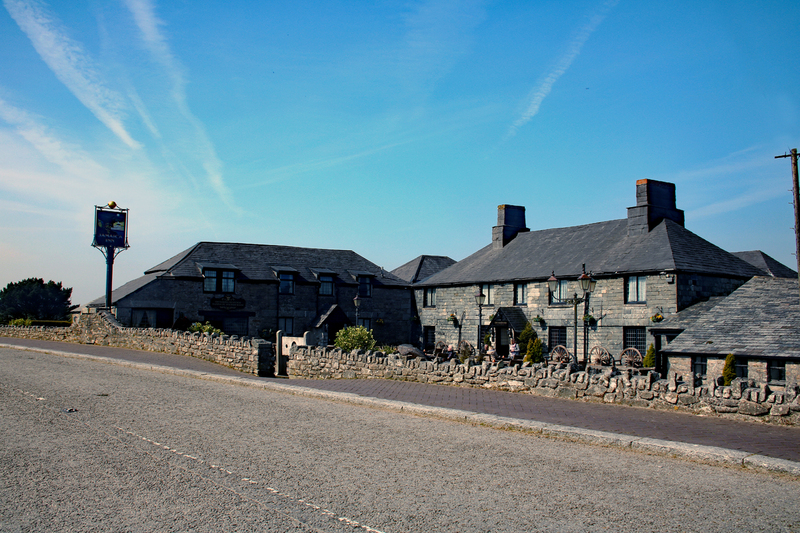 The Watts eventually placed Jamaica Inn, with six and a half acres of land, on the market in 2014 and sold it for a figure in the region of £2m early that year.